It's with pleasure that MACAP organize a round of the World Cup FA3 FAI. C'est avec plaisir que le MACAP organise une manche de la Coupe du Monde F3A FAI. 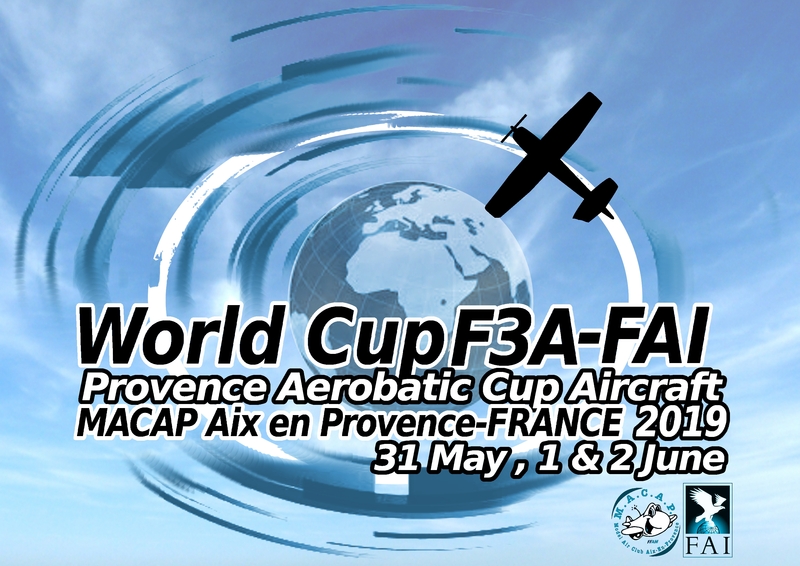 LOCATION MODEL AIR CLUB D’AIX EN PROVENCE GPS N 43°26'50" E 05°18'05"
To be qualified as competitor, each pilot must possess a valid FAI sporting licence according to the FAI rules. The sporting licence will only be considered issued and valid if the holder is listed on the FAI Sporting Licence database. - Four rounds of P-Schedule with the three best counting plus two rounds of F-Schedule. All competitors would fly 4 rounds of P-19. The top 15 pilots after preliminary ranking would fly 2 rounds of F-19. The organizer preserves the right to adapt the number of pilots flying the F- Schedule according to the weather conditions. The starting order will be drawn. The scores for all rounds P-schedule and F-Schedule will be computed using the Tarasov-Bauer-Long (TBL) statistical averaging scoring system, then will be normalized by the new system taking in account the average of the top half of the preliminary ranking (1000 points awarded to the average score) Volume F3 Radio Control Aerobatics 2019 5.1.9.e. One round/flight completed by each competitor: round/flight to count. Two rounds/flights completed by each competitor: best round/flight to count. Three rounds/flights completed by each competitor: best two rounds/flights to count. Four rounds/flights completed by each competitor: best three rounds/flights to count. The best three rounds of P-Schedule count for the preliminary ranking. When all preliminary rounds will be completed, then the top 15 competitors of this preliminary ranking will fly two rounds of F-19 Schedule. The total of the best three preliminary flights (normalized by the new system taking in account the average of the top half of the preliminary ranking (1000 points awarded to the average score) would count as one score along with the two flyoff scores to provide three scores, the best two to count for classification. As the total of the three best preliminary flights is treated as a third score (round) it has to be normalized for the 15 finalists and not for all competitors of the Preliminary, to be comparable to the two normalized F-Schedule. Les photos de la 15eme Magie du Ciel sont disponibles sur notre site Internet ainsi que sur notre page Facebook. N'hésitez pas à nous envoyer les vôtres! 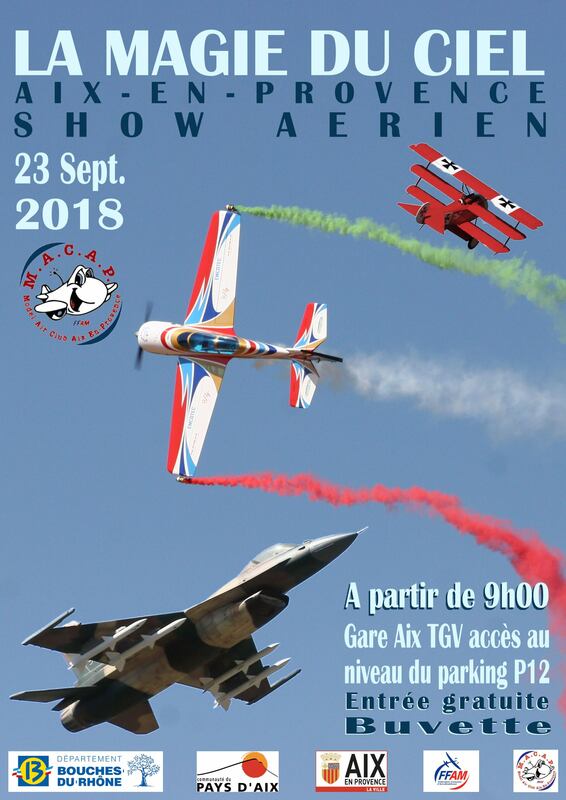 Le MACAP organise la 15e Magie du Ciel les 22 et 23 septembre 2018 partir de 09h00 sur son terrain de l'Abrois (direction Gare TGV d'Aix, parking P12). Initiation à l'aéromodélisme. Prenez les commandes d'un modèle en toute sécurité! 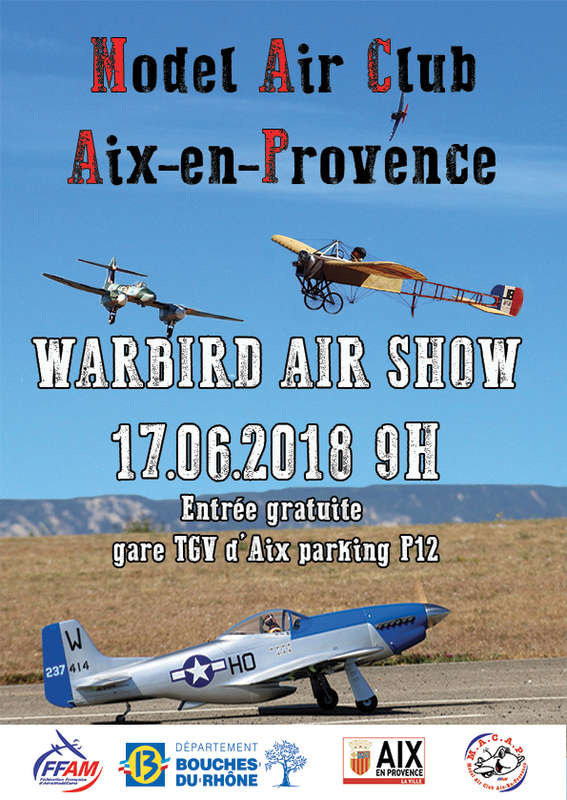 Un show aérien orchestré par de nombreux pilotes vous sera proposé avec au programme des vols de maquettes, des démonstrations de voltige et autres jeux aériens. Buvette et commodités sur place. Nous vous attendons nombreux pour partager ce moment de convivialité.